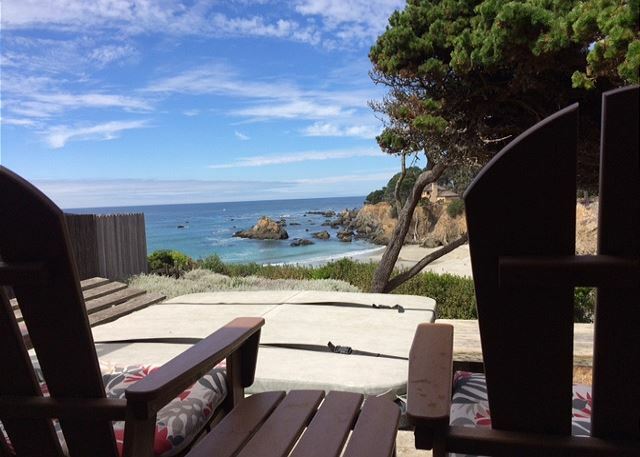 Just a few minutes from Mendocino and Fort Bragg, Windrift Cottage is a perfect headquarters for your Mendocino Coast vacation. However, with all the home has to offer you may be tempted never to leave the property. A couple minute's walk down a private path takes you to a secluded beach where you can spend the day in the sun and surf, or elect to cozy up next to the fireplace and take in dinner and a movie before retiring to the hot tub with a panoramic and private view of the pacific. Enjoy the simplistic peace of Windrift's intimate, studio-style layout, with a leather sofa next to a gas fireplace, a wide-screen television with cable and DVD collection, a luscious, pillow-topped queen bed and a small but fully equipped kitchen with a high lounge-type table for four. Windrift Cottage is the ideal spot to recharge and re-inspire. Relax with a good book on the deck, take a long walk on the shore, enjoy a good meal with loved-ones, take in the spectacular sunsets, nap in the warm sun. Windrift Cottage; it's an experience you won't want to end. To see all photos and details visit our website. Windrift Cottage exceeded our expectations! It’s such a cozy and relaxing place. The cottage is lovely and well stocked with everything you need. The moment we walked in, it felt like home. The view of the ocean and crashing waves was spectacular. Especially being able to hear the waves was extra special. The convenience of the location was perfect. The Thai Restaurant was within walking distance and the food was excellent. The proximity to Fort Bragg and Mendocino made it so easy to venture out. We are definitely planning to return here sometime soon! Awesome view, great service from rental agency. Lovely second time around! Really missed the fireplace. Bed linens are good quality but starting to show a little wear. Thanks for very clean dishes and flatware! Hi Jan, we're sorry you didn't get to use the fireplace, we have a new one going in this month. Thank you very much for the review! I was thrilled to find this gem on VRBO. The place was just as shown.Charming,well kept and the views!! I am an oil painter so I found inspiration and completed my painting from the back deckWe also thoroughly enjoyed the Hot tub. I would rent this location again. Conveniently located and a beautiful relaxing rental. Windrift Cottage is a great place to stay in the Fort Bragg area. It's a cozy little cottage with wonderful views and relaxing atmosphere. We stayed 4 nights and couldn't have asked for a better experience. We loved walking along the beach, the headlands, and down (a bit of a cliff) to a little cove that felt like it was our private little world. Watching the waves crash in the moonlight from the hot tub was particularly enjoyable. We would go back again in a heartbeat! We loved it! Initially a bit hard to find in the dark. Very cozy, great views, easy walk to beach. What a fantastic setting, so near the water. 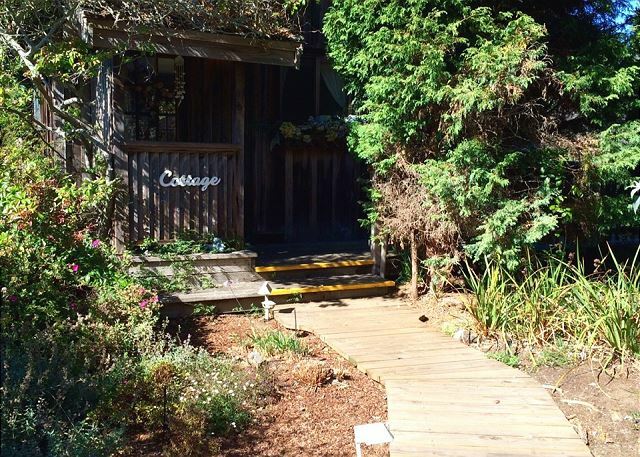 The winding boardwalk leading to the cottage guides you to a darling cottage. It is a comfortable, cozy house with a very comfortable bed. 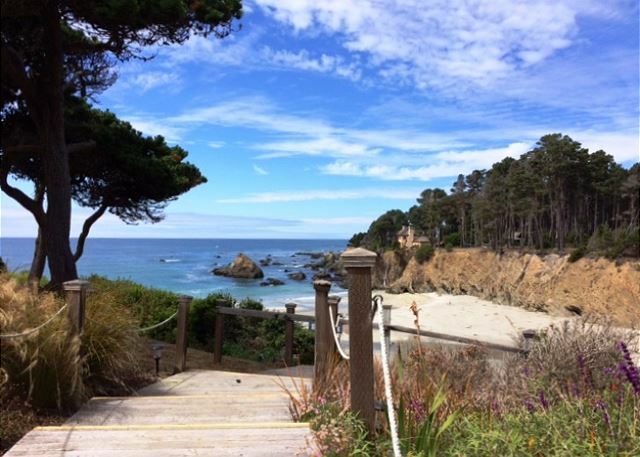 The location is very good, being close to Jughandle Park, Russian Gulch State Park, Mendocino, and Fort Bragg. 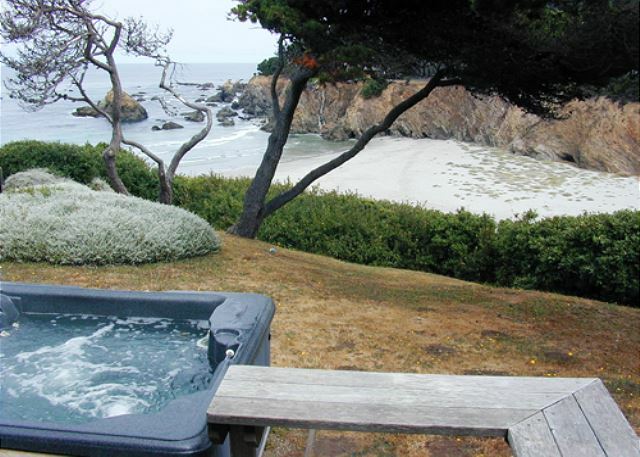 Mendocino preferred is a company that will do anything possible to make your stay excellent. Very professional and personable. They keep you updated on all information related to your stay and are very honest individuals. We loved the Windrift Cottage and will definitely return. 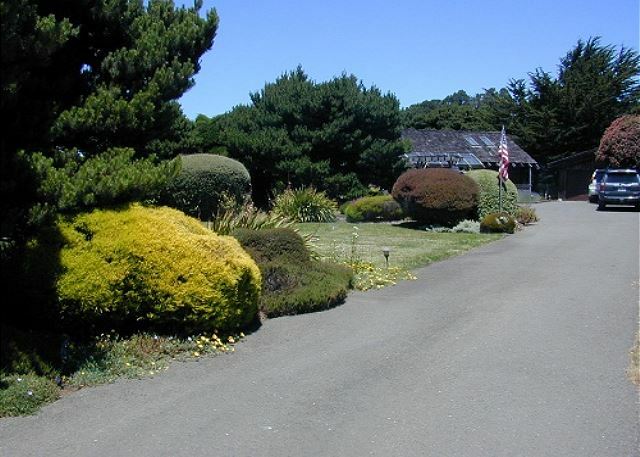 Great location between Mendocino and Fort Bragg and right on the coast! The view is spectacular! The cottage was very clean and had everything you could possibly need. We spent our 31st wedding anniversary there with our sweet dog and loved every minute. We will return. 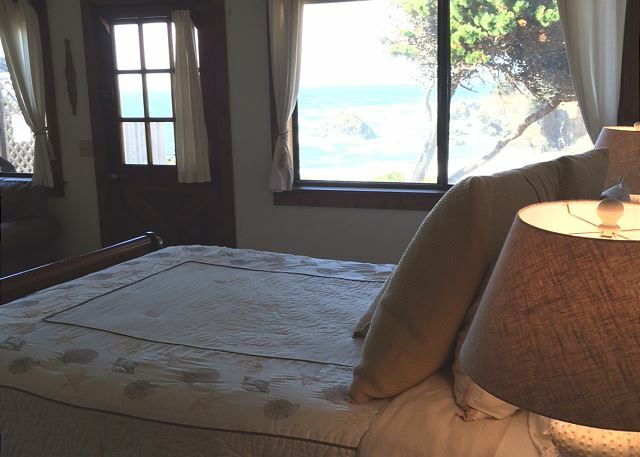 The Windrift cottage is nestled in between Fort Bragg and Mendocino. It sits close to the edge of a cliff with an easy path leading down to a lovely private beach. Our dog loved running and playing on the beach. 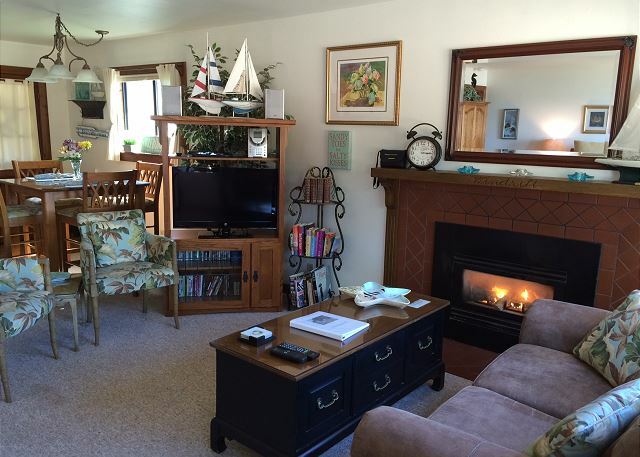 The cottage has all the comforts of home, and the perfect size for my husband, dog , and me. The views from the cottage, deck, and hot tub are spectacular. We all left feeling rested, and wishing we could have stayed another five nights. Our only wish is for the fireplace to be fixed before our next stay. The fireplace is fixed now, we're so sorry you couldn't enjoy it this trip! Enjoyed our time in Mendocino/Fort Bragg very much. In fact, already planning to return in the future. We're from the east coast and this was our first time visiting this part of the US, loved the scenery, hiking, birding and kayaking. Dining was exceptional!!! We have stayed at 8 different homes on the beach in Fort Bragg. Windrift is small but I have to say it is my favorite. The private beach was a great experience. Loved that with the window open it was like you were on the beach listening to the ocean waves. Very clean and well equipped. If I had any cons it would be that the refrigerator was to small. Will definitely be back! Cottage was clean. Good choices of dishes and bowls. View is spectacular. The hot tub was nice & hot with a great view. Love the shower head and water pressure. Think a small dish rack would be helpful to place dishes after washed. And really, really wished the fireplace worked. Last time we stayed there, the fireplace completed the experience and we really missed that this time. Thank you for the review Esperanza, we're glad you enjoyed your stay at Windrift. There is a dish rack but it is stored folded under the sink and can be hard to find sometimes. If you ever have any questions during your stay, please know you can give us a call, we are happy to answer any questions. We do apologize for the fireplace, it was beyond repair and we are currently working to get it replaced. If you stay at Windrift again, you can count on a new one being in place. Thanks again for staying with us and for sharing your experience! We stayed two nights (all that was available in our time frame). We were going to explore the area. Instead, it was so peaceful and beautiful that we spent most of our time there. Don't miss this one! We had an amazing time. The view was better than we even imagined. We used the hot tub overlooking the ocean several times. I would highly recommend this cottage for anyone who wants a great ocean getaway. Very romantic for couples but would be great for any who just want to decompress. We would definitely stay again. Cottage is nicely decorated. Owner put a lot of effort into it. We were pleasantly surprised when the automatic generator kicked on during a power outage caused by Clear Lake wildfires! A wonderful little vacation spot! We loved our stay here especially the view from the hot tub and the private beach. Everything was perfect! We found the cottage clean and well decorated. Loved our stay and want to return again soon! This rental is perfect. from the fresh flowers and the lit fireplace to the how it works booklet. Everything you need to make you own breakfast or lunch. I suggest stopping at the Harvest market for a bag lunch and drive up to the Pacific Star Winery. Everything was spotless. Great location easy access to everything yet you really felt like you were away from it all Awesome view from deck house had everything we needed ,! Our joy was being so close to the water with a view through the windows or from the deck of the waves crashing on the rocky shore and rolling onto a small private beach cove which is accessible by a maintained trail from the cottage. 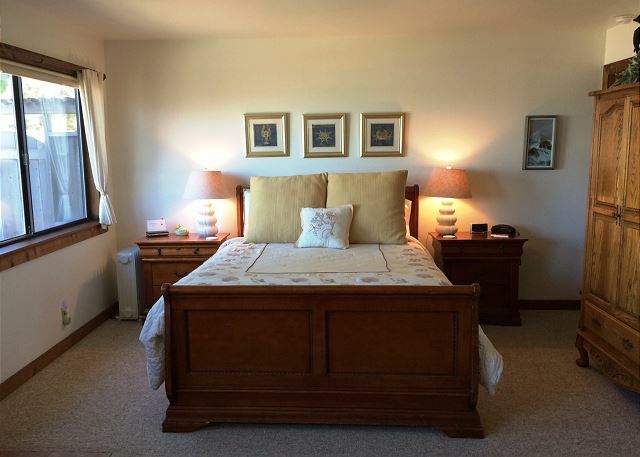 The small cottage is beautifully appointed, well cared for and very comfortable. There is a secluded, private, short, boardwalk path to the cottage from the car. 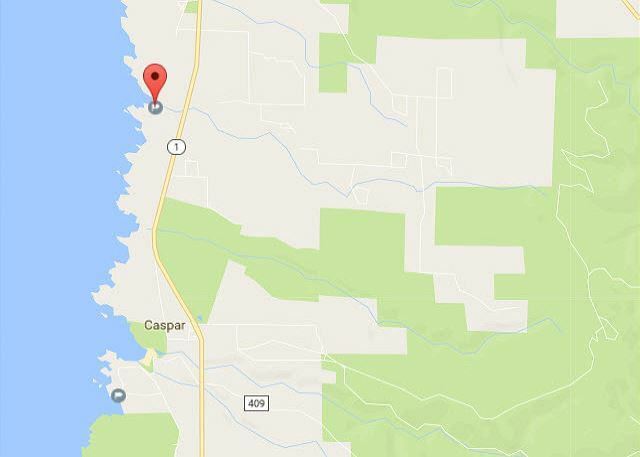 The location is in close proximity to Mendocino and Fort Bragg. The quality of the whole experience from initiation to fulfillment was evidenced by the notebook entitled "How everything works" which included local emergency info and phone #'s, how all the equipment works and local areas of interest. Beautiful cottage with all the amenities. Spectacular views. We loved everything about this vacation rental. The cute one-room cottage was perfect for my husband, me, and our dog. The cove was so wonderful and accessible. Loved the easy to use gas fireplace. And we walked the bluff a number of times. Wow. What a great place. We'll be back!! We really enjoyed our stay here. 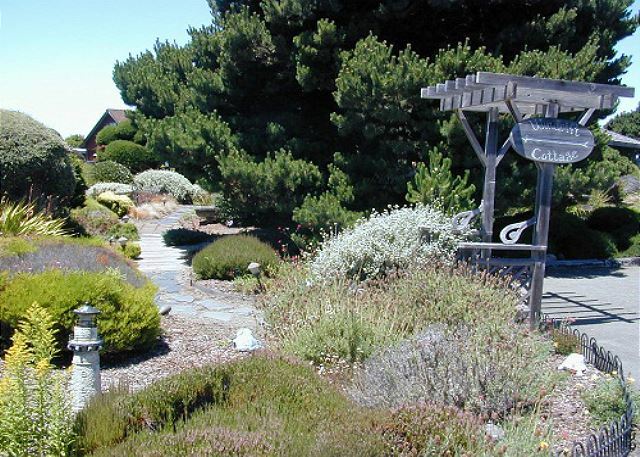 It was a short drive to Glass Beach, peaceful walk around the headlands within walking distance from the house, and beautiful landscaping and wooden path leading to the house. The cottage was smaller than expected, but perfect for an anniversary getaway for just me and my wife. The personalized touches the management company left for us at the cottage were also appreciated. We went for an anniversary celebration and everything was perfect! Cottage was well-cared for and comfortable. Great management company! a guest from Chico, CA does not recommend this vacation rental. It was okay. Not as private as described. Hi Shagay, thank you for the feedback. We are sorry the home didn't meet you expectations. If you would like to contact us with more specifics, we will do our best to address your concerns. Our email is . Thank you. Hi Shagay, thank you for the feedback. We are sorry the home didn't meet you expectations. If you would like to contact us with more specifics via email or phone, we will do our best to address your concerns. Thank you. This trip was for our anniversary celebration and we could not have asked for a better place! When we arrived, there were notes wishing us a happy anniversary and even welcoming our dog by name with a dog biscuit tied with a bow! What more could you ask for? The view of the ocean is incredible and you can see it while you're sitting in bed...or standing in the kitchen or sitting anywhere in this cute little studio. They had everything we needed in the kitchen. The gas fireplace is great for heat and atmosphere. The walk to the beach is a little steep for anyone who might have trouble with balance or taking big steps up or down but is worth the trip. We loved this place and would definitely stay here again. The 4 star rating for "general condition" category is because of the comfort level of the mattress. It was very soft and I felt like I was constantly rolling toward the center. I would highly recommend this rental. It is close to Mendocino and Fort Bragg. Fabulous location, very close to the cliff above a small sandy beach with few visitors. Perfect little kitchen area for preparing breakfast and lunch, and lots of great opportunities for dining just a few minutes away. Neighboring homes have little traffic and hot tub is well placed for privacy. The Windrift Cottage is perfect in every way. We loved the private beach, breathtaking views, fireplace, hot tub, comfy bed and location. It couldn't have been better. Beautiful little cottage with great views. Private walk to beach was awesome. We'll equipped kitchen and comfortable bed. We had a great time. This was our 4th visit, or is it our 5th? to this amazing little hideaway! If you want peace, tranquility and privacy this is the place for you. 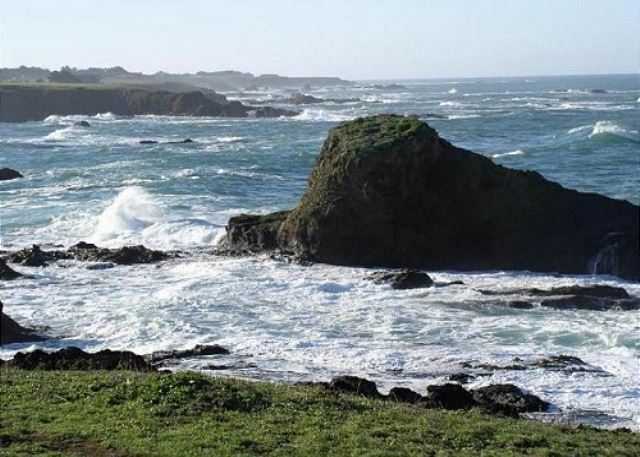 We love feeling far away from everything and yet having Ft Bragg and Mendocino just a few minutes away. Wonderful hiking nearby also and if you are lucky you can watch whales drifting by from the bed as you sip your morning coffee. Truly enchanting! This was our second stay at Windrift Cottage for our annual anniversary celebration We have stayed at several locations in this area, but the Cottage is our favorite and we will likely stay there every year. The location is great,the home has a view of the ocean from each room and from the porch and hot tub. It is a very quaint, beautiful place, comfortable furniture and a cozy fireplace. It would be hard to find anything better. As usual the staff was friendly, helpful and the place was very clean and neat. We had a great stay at the cottage over Thanksgiving weekend. The setting on a bluff overlooking a small cove and the Pacific Ocean can't be beat. 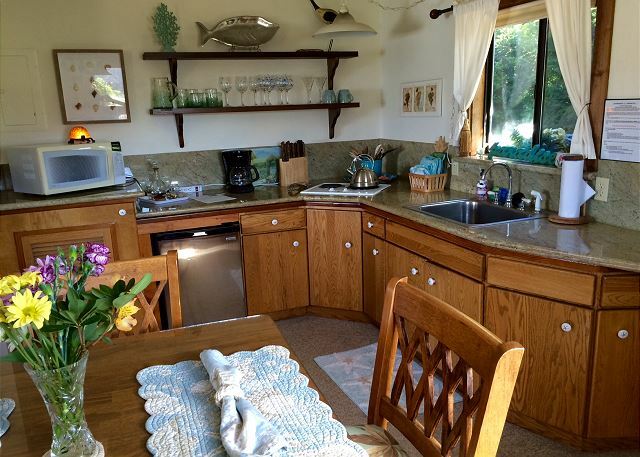 And having a functional kitchen -- although small -- really worked for us since we didn't want to have to drive in to either Fort Bragg or Mendocino for meals all the time. - The bed is SOFT. Be warned those whose backs prefer a firm mattress. - The hot tub is recharged right before each visit and the chemicals were scorching to the point of stinging our eyes. I'd recommend the mgmt firm try backing off the chem bath just a touch. - The sink in the bathroom is very low. It might be an ADA thing. Also, don't trust Google Maps to find the place. It routed us to the wrong end of Ocean Drive. Look for the south end where a Motel sits right on Hwy 1. We loved the cottage as soon as we walked in! It was a lot bigger than I thought it was online. It was very clean, and the fireplace was a life saver on rainy days. The hot tub was clean and the perfect temp. I usually always feel the need to wash the dishes before using them in rental houses, but these dishes were very clean. The bed was soft and comfortable! There were plenty of towels and amenities! The staff were very helpful when I called for directions! We had trouble finding the cottage, however. Partly because it was at night time and raining when when we arrived. I would definitely recommend it to anyone! We didn't bring our dog but it had a nice grassy area out back that would be perfect for a little dog on a leash. Loved it! We had a wonderful trip. Lots of memory making moments!! Overall great time..slightly smaller then we expected..one of the burners were a problem getting on..one on the left..would be good if there was hooks outside for towels while in the hot tub..coffee machine was also a bit of a problem..more wash clothes..we only had three and were staying 4 nights.. The Windrift Cottage is a perfect place to let your cares melt away as you watch the waves and listening to the crashing surf. The scent of eucalyptus was a pleasant surprise, as we approached the front door to a clean, comfortable and cozy cottage. Mendocino Preferred staff customized our stay and made us feel at home. We hope we can come back for another special stay at this magical property. Thank you! Perfect location! Can't wait to go back! This little one room cottage surpassed our expectations. Perfect for a couple seeking a romantic getaway. The only item to be aware of is that the stairs do not go all the way to the beach and you do need to be physically capable of getting down the last few feet of the hill without stairs. For us, this was fine- but I do know friends who would not have been able to get to the beach because of this. OTHERWISE- this place is clean, comfortable, well managed, well maintained. We look forward to coming again. We were looking for a quiet romantic place to stay for a postponed anniversary trip and Windrift Cottage was ideal! It was just the right size for the the two of us, very cozy. It had all the amenities we needed, everything was in perfect working order, very clean, very well put together. The view of the ocean and the beach was beautiful, and we spent a great amount of time on the back deck or in the hot tub just off the deck enjoying the view and relaxing. Its about a five minute drive to either Mendocino or Ft. Bragg, really couldn't walk to either but that's not a loss, it helps with the privacy and quiet. The management co. folks were great to work with; friendly, organized and professional. And they left some nice thoughtful surprises for us knowing it was a special occasion. We definitely plan on staying here again and enthusiastically recommend it! The beach is not as easily accessible as it looks. Perfect view, lovely cottage. The Windrift Cottage is THE perfect spot for relaxing! The photos you see are lovely but it's truly more beautiful in person! 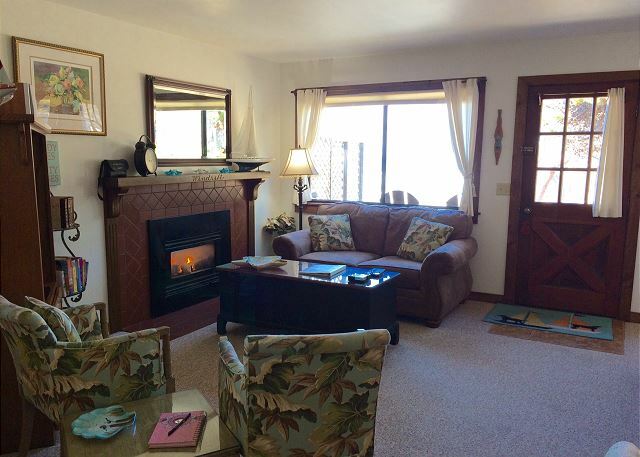 It's quiet & peaceful, easy access to Fort Bragg or short drive to Mendocino. The cottage has everything you will need for the stay. A beautiful relaxing, private getaway on the coast. my wife and i love this place. we have stayed here at least 16 time over the years and have never been disappointed. we will be back sometime this year. I've enjoyed Windrift before on two occasions making this my third. It's one of my favorites. Walkway to the beach, view, and access to all the areas beautiful spots. I love it! Great location, close to town but secluded. The house was so wonderful we didn't want to leave to eat dinner. Great view, close walk to the beach, great hot tub, nice linens and dishes-what a great place. We will return!! Enjoyed our stay at Windrift Cottage. This was probably the 5th or 6th time that we have stayed at homes managed by Mendocino Preferred. Each one has been wonderful. Windrift was an excellent location for our dog. Easy access to outdoors and walking areas. The grounds were beautiful. We had a fabulous time - great weather, perfect ambiance, and georgeous view!! The process from beginning to end was super easy. All staff I interacted with via phone or email were friendly and helpful. Nice & cozy studio with fireplace . Lovely ocean decor. Enjoyed hot tub & awesome Oceanview,private beach. Comfortable bed too. Hope to visit Windrift Cottage again. Very nice. We were concerned the cottage might be too small or not have a good view of the ocean. But we walked in and said "this is just fine". We were also concerned about the "long" walk to the cottage from parking. NO PROBLEM! It was a raised boardwalk and lighted! I imagined walking thru mud when it rained. Did miss a toaster oven but that was minor. Windrift Cottage is a wonderful place to stay! Everything you need for a perfect vacation. Online pictures do not do it justice. Comfortable, very clean with a great view! The grounds are beautiful. 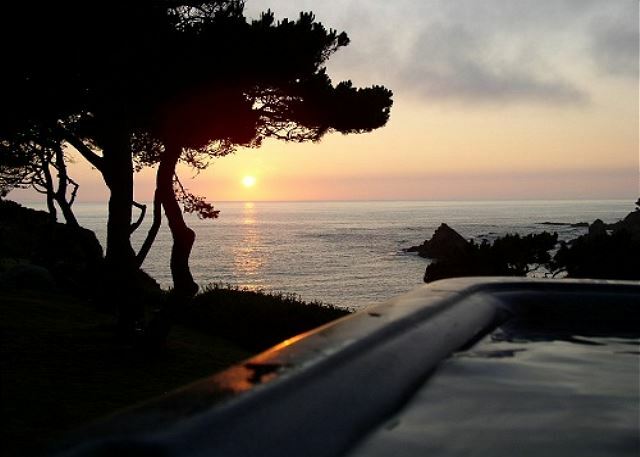 We have stayed at several Mendocino Preferred properties and they have always been excellent. A quiet comfy stay with only the sound of the ocean! Its a small place but cozy. We were long overdue for some relaxation and some quiet time alone.......this was the perfect place for that. Clean, cozy, quiet and the views were stunning. The hot tub was clean and easy to use. Sitting in the hot tub, overlooking the cove views was almost surreal. Spent two romantic nights here with my husband. The cottage's kitchenette was well stocked but clearly had limitations for cooking -- a 2-burner electric cooktop & small under-counter frig. We made breakfast at the cottage once & snacked there but, otherwise, dined out. The weather was absolutely perfect -- beautiful late summer weather; sunny & warm days, no fog at all. We enjoyed star lit nights in the hot tub, the remote controlled fireplace, & loved the continuous sounds of the waves on the beach below. Very soothing sounds of nature & a very private location. Enjoyed taking our dog for a romp down below on Pine Beach. Our only complaint would be that the bed wasn't the most comfortable. Otherwise, this little bungalow was everything we hoped for. Excellent experience in every way. Beautiful setting, just right for the two of us, surf sounds all day and night, rental staff very pleasant and professional. Can't think of anything we would have wanted to be different. We immediately loved the grounds leading up to the door and upon entering the cottage were completely taken aback by the beauty and stunning view. We found this to be even more gorgeous than the photos online and how often does that happen? We enjoyed the coziness of the cottage as well as the superb layout and appointments. We loved the idea of the hot tub, but found it almost impossible for persons of our age to actually use it without some sort of a ladder. Our favorite outing was to the Botanical Garden along with many other wonderful places to explore. The location of the Windrift Cottage couldn't be more perfect and we look forward to going back again and again. We loved the cottage and wished we'd had another day. The view is amazing, and it was wonderful to watch how it changed throughout the day. We also loved being in the hot tub under the stars after a long day hiking. It's secluded, but with easy access to Ft. Bragg and Mendocino. Overall, the cottage felt clean and very comfortable (although the mattress topper was way too soft, and I woke up with a sore neck). The cottage is well supplied. We'd definitely recommend it and would consider returning. The only complaint is that the house instructions say renters are to clean the kitchen before they leave; for the price one pays, I don't think that's right, and we ended up wondering if the dishes and utensils had only been cleaned by the previous tenants (and, therefore, how clean they were). That aside, we enjoyed being there very much. We were very comfortable, the two of us and our dog, at Windrift. It is peaceful and beautiful, and the views are outstanding. The kitchen is small, and there is nothing more than salt and pepper, so you must bring your own supplies. The refrigerator is also quite small. But the hot tub was delightful and you can take many orgeous hikes on diferent paths out on the bluffs. Suzanne P from Calistoga, CA does not recommend this vacation rental. This place was perfect to celebrate our 20th wedding anniversary. Loved being able to walk to the beach with the dog and Jug Handle State park was also right outside the back door. Beautifully appointed and the kitchen well is stocked. The landscaping is also exceptional. We opted to get takeout from one of the restaurants in Mendocino for our anniversary dinner, to enjoy on the deck, because the view is spectacular!!! windrift cottage always a treat for me & the dog. My third trip to windrift cottage. Never a problem. Everything works. Hot tub clean with a great view. Very relaxing Cottage. Perfect for sipping wine and watching the Whales swim by headed north. A perfect escape; I didn't want to go home! From the sound or the ocean to the chirping birds. The relaxing view and the hot tub were just what we needed! I have used MPVR for several years along the Mendocino, Casper, Ft. Bragg coast. I wouldn't use another. They only have "top rentals" of which Windrift Cottage is one more example; on the water. VIEWS & amenities top notch. Everything is clean and ready to use. I enjoy Patterson's in Mendo along with shopping in town. Fr. Bragg is best for gas & is only 2+ miles N & has anything a visitor could need. I look forward to my next visit. MPVR staff are all top notch and professional. We really loved the windrift cottage. The views are stunning and there are trails along the cliffs only a minute from the front door of the cottage. It was clean and had everything we needed to make meals. We liked the gas fireplace and it really heated the cottage quickly. Spent the weekend enjoying the incredible views from the inside of the unit. It was beautifully decorated and comfortable. Wind and rain added a dimension to the pounding surf. Didn't spend much time outside, and had to retie the cover to the hot spa as the winds were intense. A great place to be on an extreme weekend. I'm sure it would be as beautiful on a calm weekend. Stunning view day and night!! was just as spectacular. We slept with the windows open to hear and smell the ocean and loved being able to quickly warm up in the morning with the gas fireplace. The nearby Safeway store in Fort Bragg has a great grocery/meat/seafood selection, additionally I had purchased a pizza but found there is not an oven, so we bought some charcoal and grilled it instead. Though the refrigerator is quite small, it was adequate. There are plenty of glasses, dishes, utensils and cookware and was well stocked with extra towels and blankets. The WiFi was excellent and the grounds are well maintained. Would I go back??? In a heartbeat!!! I'd love to rent both the main cottage and the studio and have a family vacation there. Wish we could have stayed longer. Excellent! Great Oceanfront setting, comfortable heat and fan. The hot tub with the ocean view couldn't be beat. The mattress was perfect. And someone left us Cognac upon arrival! The cottage was perfect for a couple. More than I expected Great location and very private. Already gave 2 co workers info for them to call and stay at the cottage. We love the Windrift Cottage. Our dog loves the Windrift Cottage. It is a secluded cozy romantic gem. This was our second stay, and we will definitely be back. We always have rented this property in addition to Pine Beach House. While the kitchen has most of the basics, it's nice to have access to full kitchen amenities, especially an oven. That said, we rotate this cottage among our three couples as its privacy and own hot tub create a nice oasis. The comes as a premium that we are happy to pay. My husband and I stayed at Windrift for 4 nights. It is a wonderful place, very nice amenities, beautiful outdoor areas, a great deck and a beautiful view. A perfect place for 2! Everything was very smooth. Our stay was a lot of fun and we all enjoyed it. We had three people (Grandpa, Son and Grandson). All enjoyed the Wifi! My suggestion to possible renters is that this is ideal for a couple and that would provide the maximum experience. Ideal for lovers!!! We rented both the cottage and the beach house next door for a group family vacation and it could not have been better! Beautiful views, great amenities, very private and relaxing! The cottage is a perfect get away for a couple or small family while the beach house is perfect for a larger family or a little more luxury or cooking space! We will return for sure! Absolutely wonderful experience. The cottage was comfortable, the bed and bedding top rate (though I prefer down pillows) -- the deck and views amamzing. BEAUTIFUL! Was not my first time to stay here but this time was a very special occasion for me. I want to come back again in late May or early June in 2017 with my family. I so love this this place. Thank you for sharing your little place in heaven. LOVED IT. A beautiful place to spend a quiet relaxing week. The cottage is beautifully decorated and well stocked. The outdoor are is well landscaped. My husband and I have stayed at the Windrift three times and 8 whales breaching and lots of blow spouts were seen this trip. We already booked our trip for next year. This third time was definitely the charm. If you just want to sit and relax while listening to the ocean or just enjoy a beautiful view, this is the place to do it. You know how sometimes you wonder if the photos you see online are accurate? Well, they definitely were! The Windrift Cottage was absolutely beautiful and we loved everything about the place. The view was spectacular. There was no scrimping on quality - all the features were perfect. Cannot wait to return. Every time we come here (13 and counting)we have always enjoyed the cottage and everything about it. Sooooo relaxing.we hope to be back many more times.We have recommended it to many friends. Our stay at windrift was just what we needed. Pictures do it no justice. Dream spot for relaxing getaway! I had the pleasure of staying at the Pine Beach house and Windrift Cottage of Thanksgiving with family and friends. I couldn't have been happier and this sentiment is shared by all that accompanied me. Perched on a cliff above a serene cove with expansive views to the ocean was simply amazing. Thank you for the hospitality. This was a beautiful place to get away! Private beach to walk down to, fantastic view out the windows and on the deck, hot tub, cozy cottage - this place has it all! We were so happy with the Windrift Cottage! The refrigerator is a bit small, but that is the only negative I could possibly come up with. Absolutely stunning view, and the sound of the surf was marvelous. Would stay again in a minute! Beautiful house and location. Everything was great! I was already in a great mood having spent 10 days at another VBRO at Muir Beach. Staying here really made our vacation the best one we have had in terms of getting close the natural world we live in. I did not realize how much the ocean meant to me. Perhaps I took the blue waters for granted having grown up in Hawaii and now living away from the ocean for the last 24 years. If you want to reconnect to the ocean this is a perfect place. First you are welcomed with a beautiful garden as you drive in. Then you walk into a well kept studio with awesome views of the Pacific Ocean through the windows. You get the same view from the small deck and hot tub. Plus a short walk down some stairs and trail take you to a nearly private beach. The small yard with the same views could have used a bit of cleaning and management assured me this would be addressed in the future. As I said I was already in a positive mood but being able to just sit either in the studio or outside and enjoy this gorgeous setting really was an uplifting experience. We are already planning our return visit for next year. Mendocino and Fort Bragg are great towns for food, parks and art/music all within minutes from this special place. You may never want to leave so bring your own condiments if you want to cook in and a good ice chest as there is only a mini refrigerator. Perfection! Absolutely stunning little cottage by the sea! Perfect size for two people. The Brandy was a very nice, welcoming touch! Once we arrived, we never left for the duration of our stay!